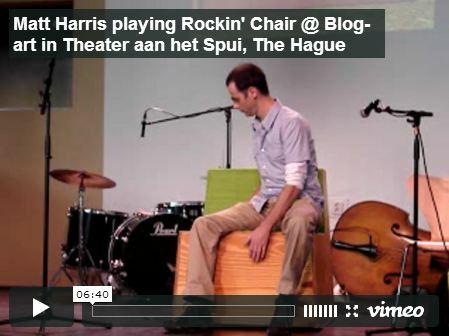 Yesterday me and my Rockin’ Chair were guests at Blog-art in Theater aan het Spui,The Hague. A festival by and for bloggers. Although organizers Marco Raaphorts and Karin Ramaker obviously worked hard to pull this off and got plenty of well deserved media attention, it still wasn’t quite what I expected… First of all there were less people than I had imagined and secondly many of the lecturers sometimes didn’t seem to realize they were dealing with an internet savvy audience or just weren’t conveying their ideas all that well. Or maybe I’m spoiled, could be. One other thing I should have realized beforehand (but didn’t), was the nerd factor. Blog-art sometimes felt like entering another world. Physical and virtual weren’t that far apart. Weird (but not unpleasant). Having said that, especially for a first edition it had a good variety of things to offer. Like John Dear Mowing Club. Even in the late afternoon, in front of a blogging/twittering audience, they still managed to impress me. Even though Erwin Blom said basically nothing new, his enthousiasm and rhetouric is extremely infectious. After a pleasant talk with Miriam Reeders and Eva Meijer, I know I should have taken more time to work through their entire blog-wall. I didn’t. I’ll probably have to go see their next performance to make up for that. 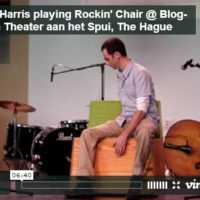 And than there was Matt Harris playing my Rockin’ Chair. He did good. Although he himself concluded that his half hour rehearsal went better. But I guess that’s inherent to the unpredictable nature of the Rockin’ Chair’s effect bank. Matt suggested I should make a more mobile version of it, like a cajón. Could be a good idea.